Do I need to make a deposit to reserve your services? Yes. A $150 deposit is required to reserve a date for your wedding and all services. Your deposit is non-refundable, but it is transferable if you need to change the day or time (based on my availability). This deposit is applied to your balance due. Please check my availability before placing your deposit. When do I need to make the deposit? I have booked my wedding with you. May I add or subtract services? Yes, you may add or subtract services up until 24 hours from the time of your wedding. No. I offer individual services, individually priced. This way, you only hire me for services you require and you only pay for what you order. When is my balance due for my wedding? The balance for your wedding is due on your wedding day. I accept checks, cash, money orders, PayPal, or credit/debit cards. Please note: A $3.50 service fee is added to each $100 charged via PayPal or credit/debit card. How far in advance can I book my wedding? Some days are more popular than others. I reserve weddings on a first-come, first-served basis. If you want a specific time on a certain date, the sooner you reserve my services, the better. When do you perform wedding ceremonies? I basically perform ceremonies 365 days a year, from sunrise to sunset. I do treat myself to the occasional vacations, so again, please check with me before placing your deposit. Do you perform LGBTQ weddings? Is it standard practice to “tip” the officiant? The rate that I have listed on my website does not include a “tip.” Even though it is not required, many couples offer a gratuity for my services. It is always greatly appreciated. Can you get my marriage license for me? No. Your marriage license is a legal document. The bride and groom will have to go together to a probate court to obtain the license. If you are Georgia residents, you can get it in your county, or you will need to get it Monday through Friday at the Chatham County probate court in Savannah. (Don’t forget about legal holidays – the probate office will be closed.) Call 912-652-7277 for more information. Do I need to obtain a permit for a beach wedding on Tybee Island? Sometimes. If you want to walk out onto the beach to get married, just do it! The beach is a public place, whether it is just the couple or you have a large group. However, if you require any type of set-up on the beach (archway, chairs, etc.) or if you want to secure a specific location, you MUST obtain a Beach Permit. I can assist you with this. May I bring my own beach decorations? Yes, but please contact me first, as there are a few beach rules and regulations to which you must adhere (NO FAKE FLOWER PETALS, no fire, no glass, no lantern or balloon releases…). I can also give advice based on my extensive experience for what works best, and more importantly, what does not work well for most beach weddings. If you bring anything to the beach, please make plans to remove it, as well. KEEP TYBEE TIDY! Where can I find the rules for having a wedding on Tybee Island? Do you still offer add-on ceremony features such as Sand Unity or Hand Fasting? I no longer provide materials for add-on ceremonies (sand ceremony, hand fasting, jump the broom…). However, if you bring the materials. I will say the words for free. Do you have your own ceremony location? Yes! I have a few select favorite locations. I can perform weddings on any non-private beach on Tybee Island. I will work with you to pick the best location. Is there an address to my ceremony location? No. I will send you driving directions and a map about a week before your ceremony date (or sooner if necessary). Please follow these instructions. Do not rely on GPS as it tends to be inaccurate on Tybee Island. Please do not be late. I understand that sometimes you (or your guests) will run into punctuality issues on a busy wedding day. However, please take precautions so that this does not happen. My vendors and I perform many weddings in one day, and are hired for specific times. ~ Make sure you and your guests read and follow the provided driving directions. ~ If possible, visit your wedding location prior to your wedding day. ~ Book hotel or rental accommodations near your wedding location. Getting stuck in traffic is not fun. ~ Make transportation arrangements if you are getting married at a “peak hour,” as parking may be limited. Is there a place to change into my wedding attire on Tybee Island? There is not a public place to get ready for your wedding. This is also why I recommend finding accommodations close to the location of your ceremony. When planning an outdoor event of any type, you should always have a “Plan B”. Even if plan is as simple as bringing umbrellas. Please make sure your back-up location in in the same city as your ceremony. On my end, I diligently keep an eye on the weather, because my ultimate goal is to make sure you have the beach wedding of your dreams. If it looks like rain or any other inclement weather is going to occur, I will officiate your ceremony and the alternate location. I will not cancel my services on account of rain if you wish to move forward with your plans. Hurricanes don’t normally come too close to Tybee Island. However, if there is the possibility of a hurricane and we have to evacuate the island, we will postpone your wedding. Note: The deposit is non-refundable even in this case. It is transferable to a future date. Can I pick my choice of photographer from your Digital Photo Package? In a simple word, maybe. My photographers all have unique but similar styles and have each done hundreds of weddings with me. However, if there seems to be one of our photographers that you think you might connect with better, let me know and I’ll do what I can to accommodate. Keep in mind that they are busy professional photographers, and your choice may already be booked. Can I set up a meeting to meet with you? Is there a charge? Why do you charge more for a wedding in Savannah or other locations? I live on Tybee Island and perform most of my weddings here. However, I perform ceremonies in Savannah and many other places in the Southeast, and will charge accordingly on a case-by-case basis. 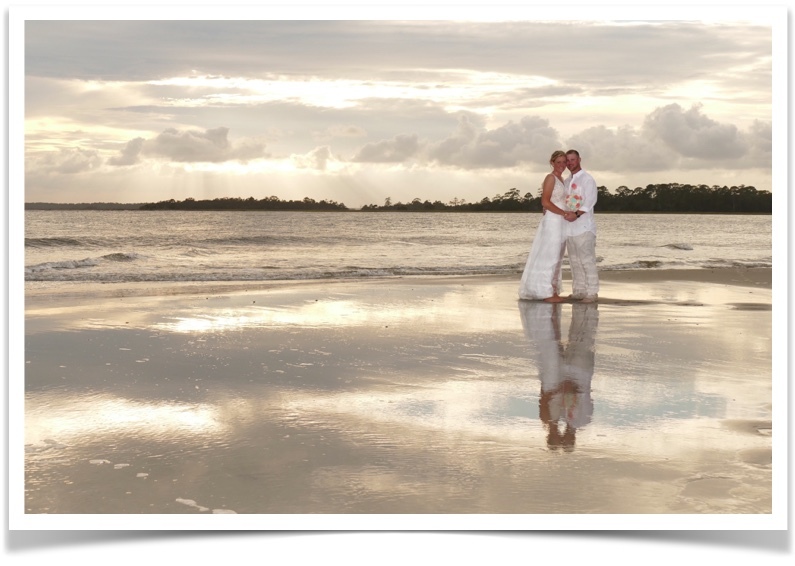 Why should I get married on Tybee Island? Tybee Island is a beautiful, small, funky coastal island with great restaurants, accommodations and lots to see and do. It’s warm most of the year, and even during our “cold times” it’s still not that cold! It’s very easy to get your marriage license in Georgia and it takes about 20 minutes. You just need a driver’s license, and there is no blood test, no waiting period, and no expiration date. If you’re picking up your license today, you can get married today! If you’re visiting Tybee to plan your wedding, you can get your license today and use it when you come back. Tybee is very centrally located in Georgia. We’re close to Savannah (20 minutes), Hilton Head (45-60 minutes), Jacksonville (3 hours), Charleston (3 hours), and Atlanta (5 hours). And of course, this is where Stephen Palmer Weddings is located! Copyright © 2019 Stephen Palmer Weddings. Powered by WordPress. Theme: Spacious by ThemeGrill.